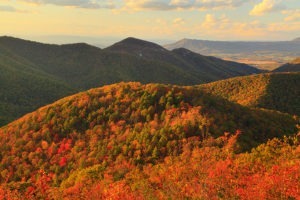 Virginia’s Shenandoah Valley is legendary for its history and beauty. The Shenandoah Valley is a 20-mile-wide basin between the Allegheny Mountains to the west and the Blue Ridge Mountains to the east. Pasture and fields, orchards and vineyards define a stunning valley landscape flanked by steep forests and cut by rivers and streams. The greater region encompasses the productive farmland of the Shenandoah Valley, the rugged mountains of the Alleghany Highlands, and the headwaters of the Upper James River. Historically, the Valley holds meaning far beyond its borders. It was the launching pad for western migration and many Americans can trace the path of their ancestors here. The region also was the location of significant military action throughout the Civil War. The Shenandoah Valley Battlefields National Historic District designation reflects the stories that can be found surrounding the 15 major battles and hundreds of armed incidents that took place here. Most notable are Stonewall Jackson’s 1862 Valley Campaign, Robert E. Lee’s drive toward Gettysburg, and Philip Sheridan’s infamous burning of the Valley in 1864. The Shenandoah Valley is a 3.8-million-acre treasured landscape. Its extraordinary natural beauty is well complemented by attractive and thriving historic communities such as Winchester, Harrisonburg, Staunton, Waynesboro, Lexington, and Fincastle. Today, thanks to Valley Conservation Council and our many partners, thousands of acres are protected by conservation easements and property owners and communities work together to help the Shenandoah Valley retain its special character.